D.A. 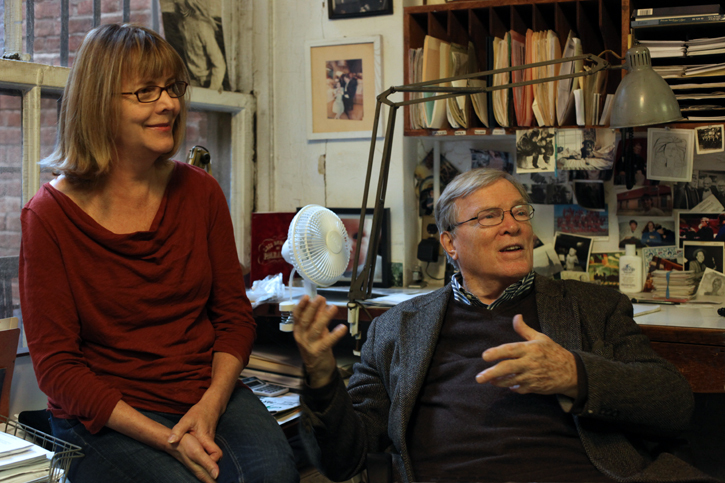 Pennebaker, the pioneering documentary filmmaker, was getting ready to fly to Los Angeles to receive a lifetime-achievement Oscar from the Academy of Motion Picture Arts and Sciences at a ceremony last Saturday night, when he took time to talk with me in his offices on Manhattan's Upper West Side about the award and his work. The exchange embraced his passions for cultural figures from the past whose influences drive him, at 87, to keep making his kind of films. His instinct toward the award reflects his approach to his work, which tends to be collaborative, most often with Chris Hegedus, his wife. The Oscar is less for him alone, he says, than for the generation of ground-breaking Cinema Verite figures who often worked together between the 1950s and 1970s, like his late friend and one-time partner Ricky Leacock, the Maysles brothers, Al and David, and others. "I feel that there are many others who should be engraved on that statuette," he says. "I'm not the only or the first." His award, presented at an event to be excerpted at the Oscar telecast in February, was the first to be given for a career in documentaries. Stuntman Hal Needham, studio executive and philanthropist Jeffrey Katzenberg and all-around film and theater man George Stevens, Jr., also got them. But none can claim the basic role Donn Alan Pennebaker played in a genre that grew from the bohemian niche it occupied when he began in the 1950s to its place in the mainstream today. That Michael Moore described his achievements to the Hollywood crowd in tuxedos and gowns on Saturday symbolized that public impact. Dont Look Back, Pennebaker's fluidly alert saga of a Bob Dylan concert tour in 1965, may be his most legendary film. Monterey Pop (1967), roaring with the intensities of Janice Joplin and Jimi Hendrix, went that era's version of viral. Many today best recall The War Room, a cinematic strip-search of Bill Clinton's 1992 presidential campaign that got nominated for a best-documentary Oscar. He was part of a team that made Primary, regarded as the first documentary of modern politics, about John F. Kennedy's 1960 nominating contest against Hubert Humphrey. His list of memorable films is varied and long. In fact, Pennebaker, who studied engineering at Yale (class of 1947) and MIT, had a big hand in designing the mobile cameras he and colleagues used to nimbly dance with the reality of events and personalities. In the townhouse occupied by Pennebaker Hegedus Films, he sits at a time-worn wooden desk in a room that would seem more cluttered if it weren't so big. David Bowie and John F. Kennedy trade gazes from large stills on the walls, from films Pennebaker worked on, amid a floor-to-ceiling jumble of family photos, awards (High Times magazine gave him one shaped like a bong) and other well-known faces. He says he actually finds the word documentary "too prosaic" for what he wants his films, which rely on close observation of unscripted changes at crucial points in peoples' lives, to do. "People don't really want reality," he says, in a voice that has a steady warmth. "They want theater and that's different. Theater is where you go to find out something new that you don't know. It goes through somebody's brain and comes out in a comprehensible way that is beautiful, that's really interesting." 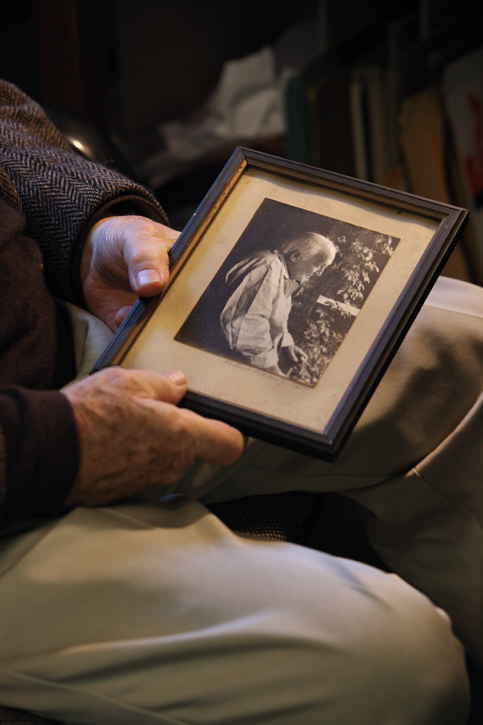 Facing him from a shelf is a photograph of Robert Flaherty (1884-1951), the father of documentary filmmaking as a popular form, with white hair. It is 90 years since his ground-breaking Nanook of the North, for which he traveled into Eskimo lands to bring back a story of struggle and survival in a frozen landscape. Flaherty pursued the Victorian heroic ideal that propelled explorers across the globe into his epic career. Pennebaker holds the photograph in his large hands. He says his feeling for Flaherty is personal because Leacock worked with Flaherty on a later film and because he recalls how Nanook imprinted itself on him when he was a young man. "I wanted to make a film like that," he says. "It all started with him." D.A. Pennebaker holds a photo of Robert Flaherty, regarded as the father of documentary filmmaking as a popular medium. Photo by Steve J. Sherman. Pennybaker's blue eyes are restless, looking for something else to point out. He swings around and spreads his hand next to the rugged face of another man, a photo pressed under glass on top of a second desk behind him. This is Morris Engel, who made a 1953 film (together with his photographer wife Ruth Orkin and a friend) called The Little Fugitive. I recount my memory of it to Penny (which is what people call him, and soon so do I): "A little boy lost on the beach at Coney Island. He wanders in and out of groups on the beach, and the camera follows him, watching as he finds his way. You don't know what will happen to him on that beach..."
"That's Morris Engel," he says. "It's a great film. But the boy isn't lost. He's run away." This man who many people identify with his films on rock stars and politicians leans forward in his chair, taps his keyboard, and fixes his eyes on a Dutch landscape painting from the mid-1600s that fills his computer screen. He tells me it's View of Delft, by Vermeer. It shows a view of Delft across water on a partly cloudy day. "I've had it on my computer for 25 years," Penny says. "It's just about my favorite painting in the world." He tells how a character in Marcel Proust's In Search of Lost Time dies in a fit upon looking at the pure beauty of a yellow patch of sunlight Vermeer painted on a wall in the picture. Proust, it seems, swooned upon seeing it when it traveled to Paris, then gave it fatal power in fiction. Penny exclaims: "It's so beautiful he dies!" He tells me of being enveloped in the immense novel at 18, of tracking down a reproduction of the Vermeer. He seems serious when he tells me he absorbed the painting "so strongly that I came to believe I lived in Delft in a previous life." He's even been to Delft to visit the painting at a museum and wander in his déjà vu. He tells me the painting whispers a forward-reaching hint of movies. Vermeer, he says, "wants to tell me there's a way of making this move but he doesn't know how. He's telling me about movies. The clouds are going overhead, and he's trying to show that there was a moving picture he couldn't get. From the 1600s, it's a signal to me." He says he also identifies with Vermeer's work as a portraitist. "He wanted to get people who interested him fixed so they would never die. So they would always be there. I wanted James Carville to never die. I wanted Dylan, the poet, to not die. I wanted to put these people in a place where they would be inviolate. It wasn't enough to have a still life of them. I wanted to surround them with the lives they led." Hegedus, who has longish blond hair and an unforced presence, enters the room and reminds him of an exchange they'd had: "You said that you never saw yourself as being a hero, but that you looked for heroes all through your life." "That's true," Pennebaker says, simply. "I believe in the people who go up the side of the mountain with their gloves off. Dylan falls into that, Dylan the poet. I didn't know Jack Kennedy that well, but Bobby was a hero to me. Janis was a hero to me. So was Jimi. They were so good at what they did, and they had courage." 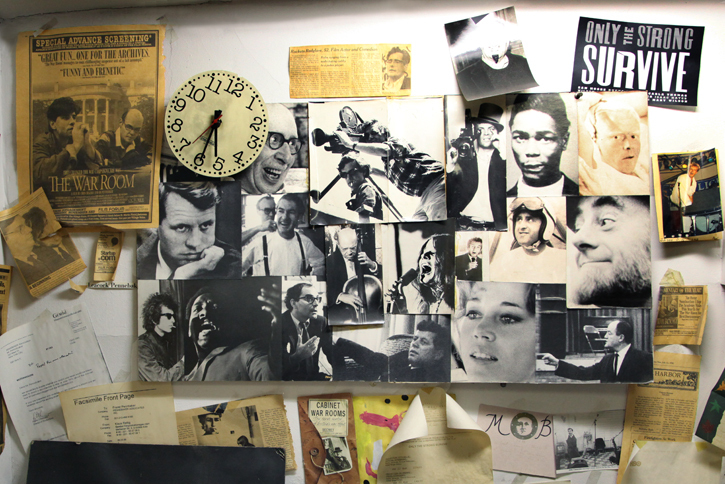 Faces from Pennebaker films through his career, in a collage of stills at Pennebaker Hegedus Films. They include John F. Kennedy, Robert Kennedy, Janis Joplin, Bob Dylan, Igor Stravinsky, Jane Fonda, Norman Mailer, Otis Redding, Hubert Humphrey, Tim Leary, Ricky Leacock, Pablo Casals, Jean-Luc Godard and Pennebaker in a top hat. Photo by Steve J. Sherman.